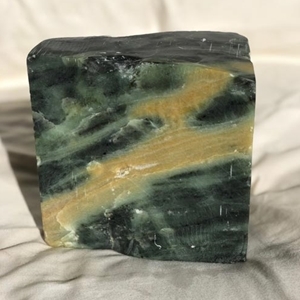 Forest Green Soapstone - 6 lbs. Home → → Forest Green Soapstone - 6 lbs. One of our newest imported carving stones to become available in years with strong varied coloring. The predominant deep forest green color has been made more interesting with additional black, grey and stripes of pale to rich yellow. The medium soft stone is pure and smooth-grained with almost no flaws for great carving. Please note, the stone in this image has been finished/polished. The stone you will receive is unfinished and will vary according to your finishing techniques. In addition, the shapes of individual stones, which are cut by hand, may vary. And finally, the colors of the stone you receive with your order may vary from the colors of the sample stone on your screen. The stone pictured is not the stone you will receive.